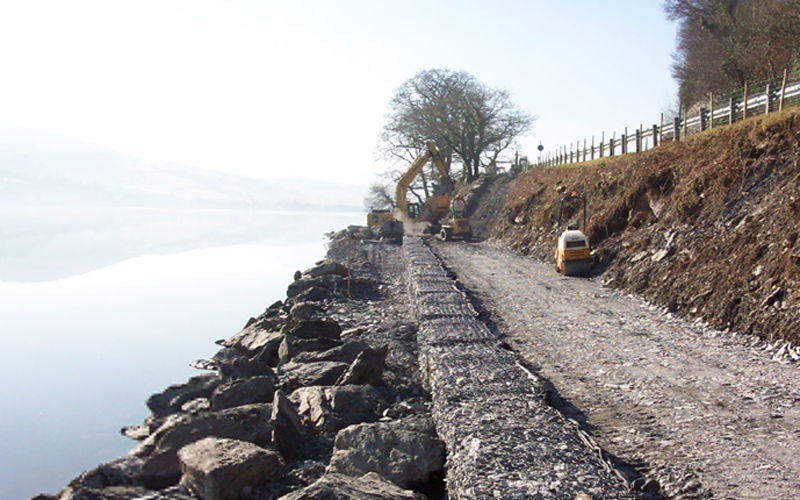 Following a site investigation it was discovered that approximately 200m of the embankment supporting the A494 had been eroded by the water of Bala Lake near the village of Llanycil approximately 1mile west from the town of Bala, Gwynedd. Fortunately the damage was discovered before the road had been affected although the safety fence had lost all of its support in some sections. Bala Lake is the largest natural lake in Wales and the Environmental Agency control the level of the lake to reduce the risk of flooding lower down the Dee valley. The level of the lake can vary by as much as 4m and this did cause problems during the scheme. Both the lake and the river are a designated Special Area of Conservation (SAC) with otters living along the banks, rare ‘Glutinous Snails’ living within the shallow waters along the edge of the lake as well as the ‘Whiting’ fish which is unique to the lake. storage capability within the lake to hold any flood water back to minimise the flooding risk further down the valley, although we did loose a few working days during the scheme due to part of the site being submerged in the lake. 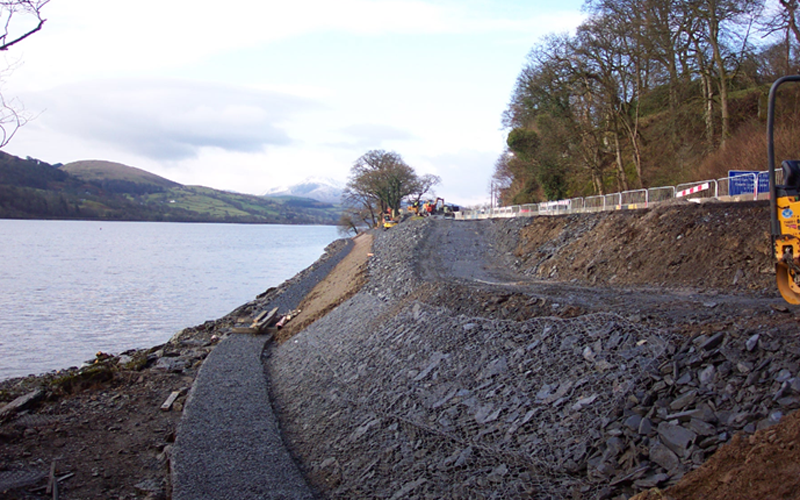 Various options were considered to strengthen the road embankment and to prevent future erosion. Due to the pollution risk and cost associated with concrete, constructing a concrete wall of similar detail to existing retaining walls that can been seen at other locations along the lake’s shore was dismissed. In the end the preferred option was to construct a reinforced embankment incorporating gabion baskets and mattresses along the toe to prevent future erosion. A new safety fence was installed along the top of the embankment to reduce the risk of vehicles leaving the A494 and landing in the lake. The gabions were hidden using large boulders in front of them which provided extra protection and gabion mattress along the face of the batter was top soiled and seeded. 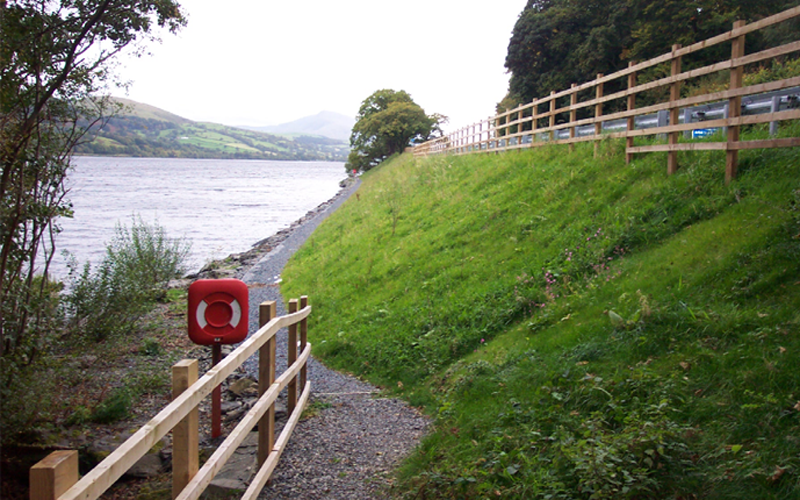 A new path was constructed along the top of the gabions to replace the previous footpath along the lake shore. This path had to be constructed using concrete to prevent any erosion and at the same time protect the top of the gabions. Chippings were placed and lightly tamped on the wet concrete surface to blend the path into the surroundings.